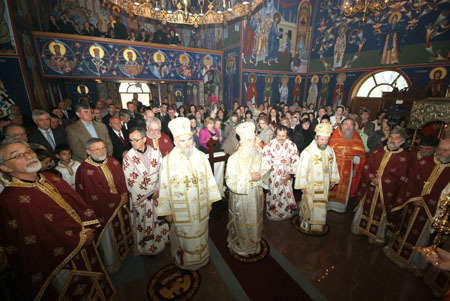 PATRIARCH OF SERBIA TAKES PART IN THE 25th ANNIVERSARY OF "ISTOCNIK"
Milton, Ontario - His Holiness Patriarch Irinej of Serbia officiated at the Holy Hierarchical Divine Liturgy on Bright Friday at Holy Transfiguration Monastery, the headquarters of the Canadian Diocese, with the concelebration of the diocesan hierarch, Bishop Georgije of Canada, Bishop Dositej of Brittan-Scandinavia, all the clergy from the Deaneries of Eastern Canada. In this manner, in a filled church with over 400 faithful present and with the singing of the diocesan choir "Kyr Stephan the Serb", did the celebration of the Slava of "Istocnik", the diocesan publishing house, as well as their 25th anniversary, begin. "The beauty of the Orthodox faith is reflected in the beauty of the Orthodox services, the beautiful churches and monasteries with the frescoes and the people who with their lives witness that faith. All of this, we have been made convinced today, all of you have in your Diocese of Canada. The blessing rests on you for you have kept the faith of your ancestors: with the concelebration of this great number of priests and the angelic singing of the choir in this beautiful, frescoed monastery church, with your faces which shine in piety can compare with the faces on these frescoes, you are on the path to being worthy descendents of your ancestors, that the Lord blesses you and your posterity," said Patriarch Irinej in his homily in the church. Following the Divine Liturgy a Slava banquet was served in the monastery guest house. Slava kumovi were Jovan and Rosa Rnjak from Brampton. The 25th anniversary of "Istocnik" was also commemorated with a spiritual academia/program in the Library and Diocesan museum building. V. Rev. Stavrophor Ljubomir Rajic and Dr. Davor Milicevic, the editors-in-chief of the Istocnik spoke of the significance of the Diocesan periodical. Also promoted during the program was the newest publication which "Istocnik" completed in collaboration with "Serbian Literary Association", Selected Poems of St. Gregory the Theologian. The academia program was enriched by guests from Belgrade, performing artists Rada Curicin and Vjera Mujovic, who performed a scene from the play "Man to man". At the end, Bishop Georgije thanked His Holiness for the great honor and sacrifice he made, while Patriarch Irinej in his concluding remarks once more stressed the significance of the written word in Serbian and the mission of "Istocnik" which has been successfully achieved. On the occasion of these "Days of Istocnik" Slava, recognitions were also given: Episcopal citations to author Radovan Gajic, Milomir Glavcicu and actors Dimitrije and Ana Porobic. The Patriarch personally delivered the Order of Saint Sava to benefactor Dragana Vujacinovic-Hartog from Toronto. The canonical visit of Patriarch Irinej continues on Saturday with the Holy Hierarchical Divine Liturgy at St. Nicholas Serbian Church in Hamilton, on Barton Street.